If you're hunting for an off-duty but also stylish ensemble, consider teaming a black blazer with black leather leggings. For a more elegant touch, why not complete your outfit with Alexander McQueen Armadillo Pump? Want to infuse your closet with some effortless chic? Team a light violet long sleeve blouse with blue jeans. When in doubt as to the footwear, add a pair of Alexander McQueen Armadillo Pump to the equation. 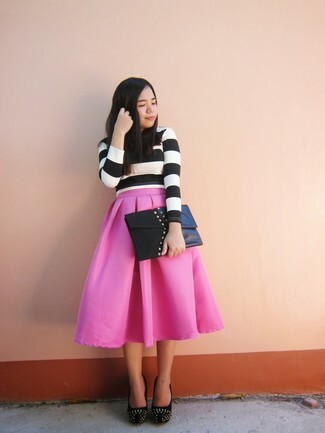 For a laid-back and cool getup, reach for a black and white horizontal striped cropped sweater and a hot pink pleated midi skirt — these two pieces go nicely together. Ramp up your ensemble with a pair of black studded suede pumps.